Okay, maybe don’t fill your entire plate with it, but think about adding it to your diet. Garlic is a nutrient-packed, pungent, and beneficial addition to many dishes. The flavor and aroma of garlic is unmatched. It can be prepared and incorporated in a variety of ways. Some of my favorite ways to spice up dishes with garlic in my kitchen: I add it to oils before I sauté veggies; I add it into a marinade; I’ll put in in salad dressings. I put it on every protein imaginable (except my protein shakes). When I add it to olive oil while it’s heating up, it fills my kitchen with the subtle smell of garlic that brings me back to when my grandmother would cook her famous sauce. Garlic hasn’t always been stuck in the kitchen. It has been used to fight illnesses from the common cold to major epidemics. It’s been studied for its ability to aid the body by boosting your immune functions. Prevents and reduces the severity of the common cold and illnesses like the flu. This study found over a 12 week period those who took a garlic supplement significantly reduced the number of colds by 63% and shortened the length of their colds by 70%. Those are big numbers for garlic consumption! Seems as though there is one more thing we should add to the grocery list next time flu season comes. In just 6 cloves of garlic (about 18 grams), contains under 30 calories. It contains nutrients like manganese (23%)*, vitamin B6 (17%)*, Vitamin C (15%)*, copper, selenium (6%)*, phosphorus, calcium, and vitamin B1. Garlic also contains sulfur compounds thiosulfinates, sulfoxides, sulfides, diallyl sulfides and polysulfides, vinyldithiins, ajoenes, and sulfur-containing amino acids and peptides. Garlic is actually being studied for its potent antimicrobial activity. It’s potential to help treat cardiovascular disease and neurodegenerative diseases. Allicin, which is a thiosulfinate, is a compound that is responsible for its pungent smell. It’s also believed to be responsible for some important health benefits like reducing the risk of Alzheimer’s disease and dementia. Can help reduce blood pressure and promotes healthy cholesterol levels. In a double-blind, placebo-controlled trial, which included 50 patients, demonstrated that aged garlic extract lowered systolic blood pressure of those who had uncontrolled hypertension. Garlic has also been observed to lower the “bad” cholesterol by 10-15%. This is big news for those who suffer from high blood pressure and high cholesterol. More studies are being done, and many have suggested the health benefits of garlic, so having a jar of it in your kitchen doesn’t hurt! In a four-week study, employees who were exposed to excessive amounts of lead showed reduced levels of lead in the body by 19%! Just three doses of garlic in a day outperformed D-penicillamine in reducing the symptoms of toxicity like headaches and blood pressure. Adding minced garlic to marinades: When I’m in the kitchen thinking about dinner, I automatically pull out my jar of minced garlic. They’re available in the produce section ready to go. It’s usually about $5 for a big jar that lasts me months. Garlic-lemon juice is my favorite marinade. I use it on boneless, skinless chicken breasts and on salmon. In a plastic bag or bowl (I prefer a ziplock bag), I’ll place the chicken breasts (4 pieces of boneless and skinless) in the bottom of the bag. I’ll pour enough olive oil to coat. Next, I’ll add about 2 tablespoons of garlic, and squeeze in an entire lemon. Lastly, I’ll add Himalayan salt and pepper to taste. I’ve let this marinade sit for about 10 minutes to overnight. For the best results, I found it tasted it’s best when I let the chicken marinate for 4-5 hours. I’ll place the breasts with garlic all over them, on a lined baking sheet and cook for about 20 minutes at 425 degrees Fahrenheit, flipping once. The safe internal temperature for cooked chicken is 165 degrees Fahrenheit. On a lined baking sheet, I’ll drizzle a bit of olive oil so that the pieces of salmon filet don’t stick. Once I put the salmon atop of the olive oil, I’ll flip the pieces to lightly coat the topside, but have the skins facing down. Next, I’ll add about a tablespoon of garlic (which varies with the size of the filets). 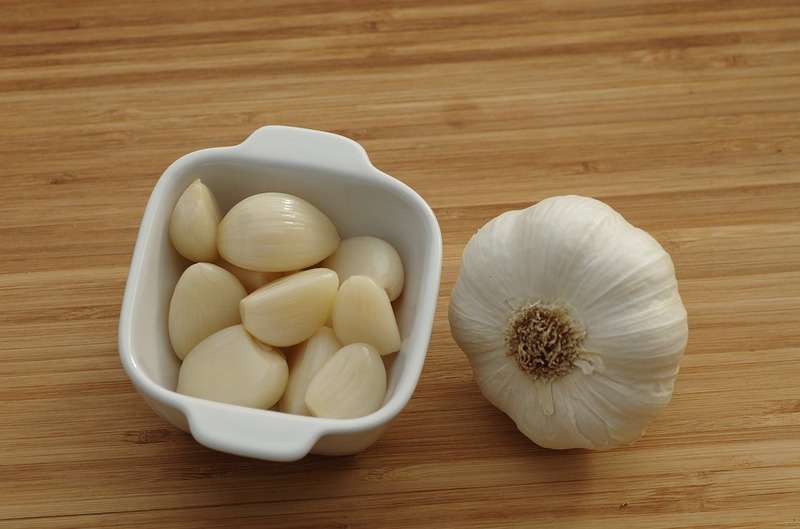 If you don’t have fresh or minced garlic, garlic powder works as the perfect substitute. I’ll squeeze a half of a lemon atop the filets, sprinkle with pepper or spices (my favorite is chili powder) to taste. Fish should reach an internal temperature of 145 degrees Fahrenheit. I also enjoy adding garlic to olive oil while it heats up, prior to sautéing vegetables. My weekly go to is sautéed spinach with garlic and olive oil. It’s super easy, and a fast way to add some fiber and leafy greens to your diet. I recently experimented with other leafy greens, and garlic does not disappoint, so feel free to substitute spinach with your favorite. Some nutritious substitutes for spinach: bok choy, kale, or try a spinach and arugula mixes. If you’re searching for more great recipes, check out the Fill Your Plate recipe section. Keep an eye out for new Fill Your Plate blog articles. New ones are posted every week. This entry was posted in Cooking, Diet Tips, Fill Your Plate, Food, Food Facts, Grocery, Health Tips, Healthy Eating, In the Kitchen, Produce, Recipes and tagged Cholesterol, Garlic, Health, Medicinal, Recipe, Vitamin. Bookmark the permalink.